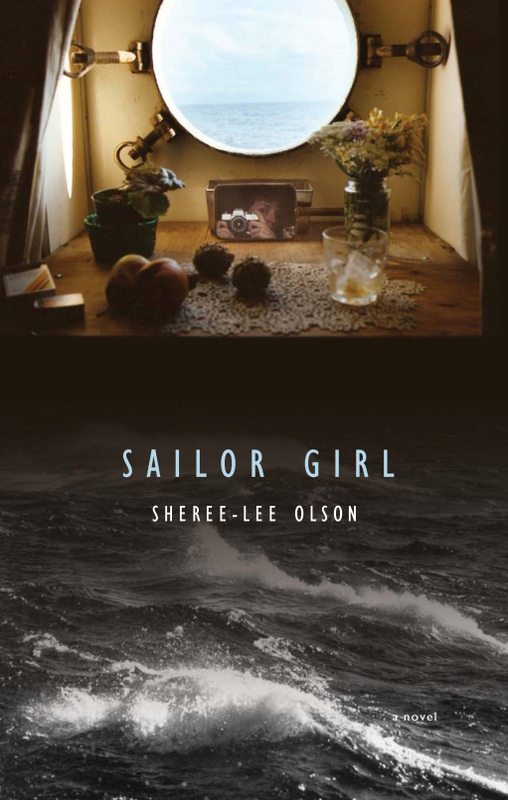 Sailor Girl, Sheree-Lee Olson. The Porcupine’s Quill, 2008. In March of 2005 the prospects for the Porcupine’s Quill were not good. Jack Stoddart’s General Distribution Services (GDS) had declared bankruptcy a few years earlier, a circumstance that was exploited by some in the book trade and resulted in catastrophic returns for small, literary publishing companies like PQL. In March of 2005 we received notice that the Porcupine’s Quill was shortlisted by the Canadian Booksellers’ Association for a Libris Award in the Small Press Publisher of the Year category. In the same week I also received an e-mail query from an unpublished author who said she had a manuscript for a semi-autobiographical novel about shipping on the Great Lakes. I was more than casually interested. My father had sailed, briefly, as a deckhand on the Lakers in the late 1930s, but my father’s father was Captain Walter Inkster of Collingwood, who was something of a legend on the Lakes. 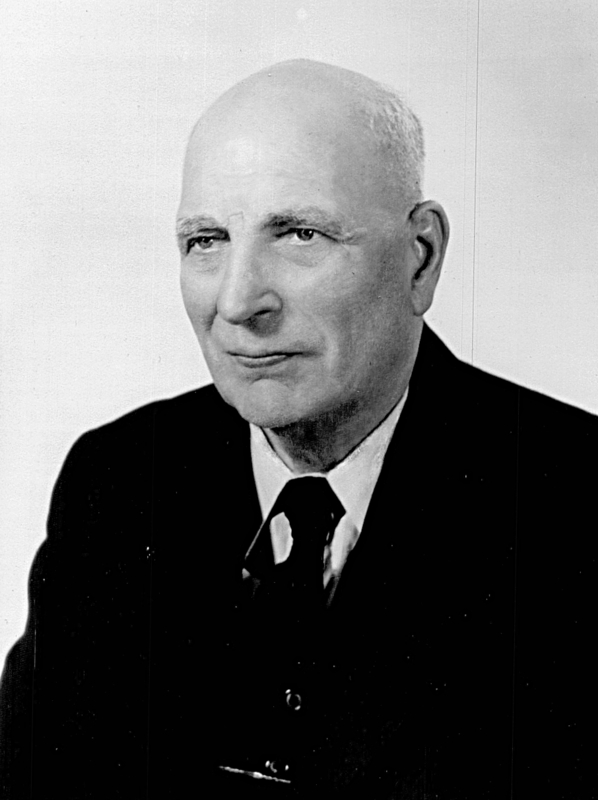 Captain Walter Inkster. A professional portrait commissioned in 1949 to hang on the bridge of his namesake the `Walter Inkster'. Captain Inkster was born in 1866 at the Hall of Hous, Burra, in a typical Shetland croft house as was his father Laurence (1833-1924) and his grandfather Robert (1789-1853). Young Walter left the Shetlands from the port of Lerwick on a square-rigged sailing vessel captained by one of his uncles when he was just fourteen. Tutored by his uncle while trading wool and tea from Australia and China, Walter soon gained proficiency in navigation and progressed rapidly to earn his Masters Papers in 1896. 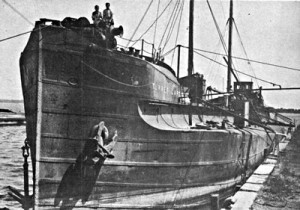 One of his early commissions was to deliver an unusual whaleback steam-powered turret-top boat, the Turret Cape, to Montreal in 1903. It was on that trip that Captain Inkster met R Scott Misener, a life-long friend who would eventually become owner of Colonial (later, Misener) Steamships. Six of the Turret-Top vessels had been built by William Doxford in Sunderland, England about 1894, originally destined for service in the Mediterranean, then brought to Canada to carry coal from the Maritimes to Montreal. When that contract expired the vessels were operated through the canals to the Upper Lakes as bulk freighters. The `Turret Cape' in full reverse. Lock 3, Welland Canal. 1906. The hulls of turret deck vessels were rounded and stepped inward above their waterlines. This design offered some advantages in strength and also allowed the boats to pay lower canal tolls under the tonnage measurement rules in effect at Suez prior to 1911. The rounded deck edge was gradually eased out to normal form at the bow and the stern, which are much finer than on a more typical canaller. The last of the six vessels to survive, the Turret Cape was converted to a tow barge at Sarnia in 1932 but later still was refitted and a Diesel engine installed in the early 1940s. 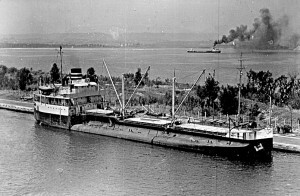 The ship was used during the World War Two in the West Indies bauxite trade and was repatriated and renamed the`Walter Inkster’ by Colonial Steamships of Port Dalhousie in 1949, the year I was born. uncertain whether the Porcupine’s Quill would survive past the fall of 2007. A few days later I received a telephone call from Rebecca Caldwell at the Globe & Mail who reminded me that her boss, Sheree-Lee Olson, was editor of the Style section of the paper. Rebecca wondered whether I would be willing to repeat anything I had said privately to Sheree-Lee, for publication. I agreed, in retrospect probably ill-advisedly, but at the time I was frustrated in the extreme and weighted with business problems and personnel problems and bank problems, all kinds of problems. `Literary gem to cut staff, book list’ by Rebecca Caldwell appeared in the Globe on March 31, 2005. The response was surprising, particularly from a number of funding bodies whose officers let it be known that I should not air my frustrations in public. Two years later I found myself `still in business’, much to my surprise, so I contacted Rebecca Caldwell to see if Sheree-Lee had found a home for Sailor Girl, which she had not. Sailor Girl appeared in June of 2008 at a raucous launch at Ben McNally Books on Bay Street. The cover is amusing because it features a self-portrait of the author as a young woman in her cabin on a Laker, and I was particularly pleased with the full-colour maps of the Great Lakes on the inside of the covers, the period photographs Sheree-Lee had taken years earlier, the engravings of portholes we used as section breaks, and the propellors we used as tailpieces. The Globe & Mail complimented the author on her `deft poetic style’ that `imprints characters and situations with casual grace and potency.’ And even Canadian Literature applauded an `honest evocation of a teenage girl’s sexuality during the early 1980s’ but perhaps the most satisfying review appeared in a labour magazine from Nova Scotia in which a sailor found much to savour. Sailor Girl is currently under option to Markham Street Films. Project Bookmark Canada has just announced the installation of a Bookmark for Sailor Girl scheduled for October 12 at Lock 8 on the Welland Canal in Port Colborne. The Colonial Steamship fleet was recognizable for its black stacks with two silver bands. The `Walter Inkster' on the Great Lakes in 1949. 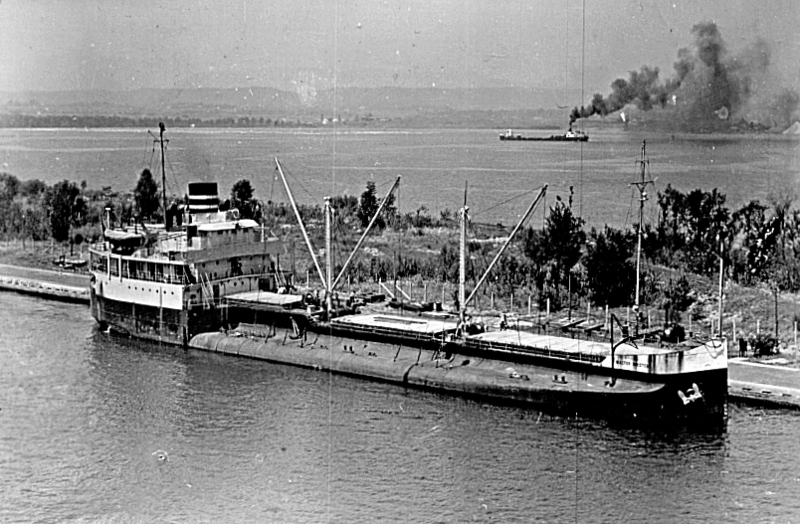 The `Walter Inkster’ was scrapped at Muir’s Pond, Port Dalhousie, in the summer of 1959. The ship’s registry was closed on September 15 of that same year. This entry was posted in Letters from the Porcupette (the Intern's Blog), Still in Business, Tim’s blogs and tagged all about publishing, behind the scenes, fiction, Sailor Girl, Sheree-Lee Olson, tim inkster. Bookmark the permalink.